Planning to cut the cord but not sure what to do next? Plex is a great media center solution, running on Windows, macOS, Linux and even some NAS devices. Want to effectively manage your media to stream it around your home? With Plex, you can. Better still, a Plex Pass extends this basic functionality, offering early access to new features, the ability to record live TV, access to movie trailers, and more. Team this up with a box like the HD HomeRun Connect Duo from SiliconDust, and you’ve got a premium system for streaming and recording TV and media around your home. Read on to find out how we got on with Plex live TV and recording features, and the HD Homerun Duo box—and at the end of this review, we’ve got an HD HomeRun Connect Duo and Plex Pass lifetime subscription to giveaway to one lucky reader! Before we look at what’s on offer with Plex Pass, let’s take a look at the HD HomeRun Connect Duo. A small black box (measuring 4 x 4 x 1 inches), and around the same size as a media streamer, it has just three physical ports. These are found on the back of the box: a TV antenna socket, Ethernet port, and DC input. You’ll notice immediately that there is no TV out; no RCA, no HDMI, not even VGA. What this device does is take the signal from the antenna and makes it available on your network. The potential is there to watch live TV from any device, simply by accessing the streamer’s URL. You can even record live TV with a $35 subscription to the DVR service via the mobile app. Two tuners are built into the box, meaning you can watch different channels on two separate devices, or watch one and record the other. Or you might prefer to team it up with a computer running the Plex server software and a premium Plex Pass subscription. This will give you a comprehensive home media center with live TV Plex Live TV: Everything You Need to Know Plex Live TV: Everything You Need to Know Plex has added live TV channels to its service, but what exactly is Plex Live TV? We have everything you need to know about this exciting new option for cord-cutters. Read More , DVR, and all the other benefits a Plex Pass brings (more on that later). Before we look at the software, it’s worth emphasizing the positioning of the HomeRun Connect Duo. You’ll need to ensure the device can be easily accessed from both antenna and router. This isn’t often the case, as routers are typically placed away from TVs to avoid interference. 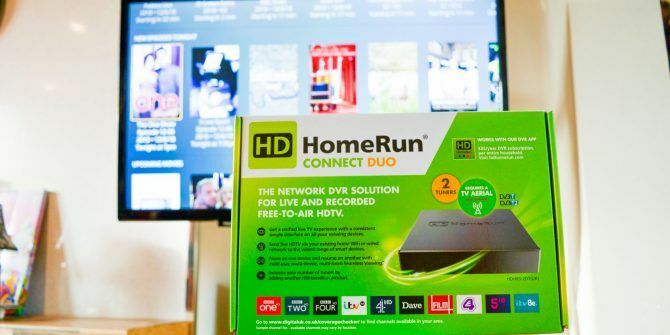 Although styled as a compact set-top box, the HomeRun Connect Duo doesn’t really need to be on show. This may improve your options for positioning, as there is no remote control; no one really needs to see it. For instance, you could place the HomeRun Connect Duo in your attic space. It’s small and compact enough to hide in the smallest cupboard, however, so you can always just stick it behind your TV. Don’t like the look of it? Don’t worry, the HomeRun Connect Duo is light enough to fix on the back of a TV or monitor with hook and loop fastening, or a few cable ties. If your home doesn’t have a suitable antenna, the HomeRun Connect Duo works fine with budget antennae. You could even connect a DIY digital TV antenna 4 Ways to Build Your Own DIY HDTV Antenna for Cheap 4 Ways to Build Your Own DIY HDTV Antenna for Cheap Want to save money and build your own HDTV antenna, but don't know where to start? These four builds show you just how easy it is. Read More and get good results. Bear in mind that this isn’t the only way to get live over-the-air HDTV into your Plex server. The supported tuner page lists other hardware you can use. Right now, there’s a cordcutter bundle offer from Hauppauge—with supported tuner, antenna, and a three month subscription to Plex Pass—for only $99. Initial setup of the HomeRun Connect Duo is straightforward. Simply pick it out of the box, connect the antenna, Ethernet (connected to the router), and the power. Before you can watch TV, you must add channels, much as you would with any digital terrestrial or satellite decoder. This is done via the my.hdhomerun.com page, where you should see a confirmation of the model, software version, and how many channels are set up. Clicking the No Channels button launches the Channel Lineup screen, where clicking the Detect Channels button will commence scanning. Once complete, the terrestrial digital channels available in your area will be listed by the HD HomeRun Connect Duo. Channels can be watched simultaneously across the range of devices you own, and where DVR is available, they can be recorded, too, all using the HD HomeRun app. Across the top, you’ll see the menu, where you can watch Live TV, view shows you’ve Recorded, or Discover what’s on other channels now and later. The Tasks screen is for scheduling a recording. An app is available for most platforms, and it’s wise to use this before installing anything else (such as Plex) to check that everything is running right. While the HD HomeRun app is good enough, with a straightforward user interface, the HD HomeRun Connect Duo is essentially supercharged if you have a Plex Pass and the Plex server app. Plex provides a host of media center options, such as in-home streaming, music library management, parental controls, and cloud sync. Plex also offers some mobile apps, which you might opt to use instead of the HD HomeRun app. However, although the core Plex functionality is free, you’ll need a Plex Pass subscription to enable the use of an external TV decoder. The best value Plex Pass is the $120 lifetime tier, but you can also pay annually ($40), or monthly ($5) if you’d rather. Not sure? Try out the 30-day trial to get a feel for things. To use the HD HomeRun Connect Duo with Plex, first ensure that the hardware is correctly set up, and you have an active Plex Pass subscription. Next, open the Plex server console on your computer (in Windows, this can be found in the System Tray), and navigate to Settings > Manage > Live TV & DVR screen. Adding the HD HomeRun Connect Duo is instantaneous, and the channels already detected can be viewed in any Plex client app via the Live TV & DVR view. For more information on Plex, check out our in-depth, downloadable Plex guide Your Guide To Plex - The Awesome Media Center Your Guide To Plex - The Awesome Media Center If you have a lot of locally-saved movies and TV shows, you need to install Plex. And this is the only guide to getting started with Plex you'll ever need to read. Read More . You might know of other media center solutions. So why choose Plex? It’s capable of streaming Live TV and recording shows with DVR technology, all presented with an easy-to-use TV guide from within the Plex interface. Plex is the perfect complement to streaming services and and bundles like YouTube TV, PlayStation Vue, etc. It unifies your media library under and slick user interface. Plex streams to more devices than any other solution, anywhere in the world (with a Plex Pass). You’ll save money with Plex over streaming TV bundles and pay-TV packages. Plex is the undisputed king of media center software. This is partly due to the client-server setup, in which a central computer runs the Plex server software, and other devices connect to it with a client app. This allows the machine with the dedicated resources to stream the data, manage the library, handle permissions, etc., while the devices running the client apps simply deal with receiving the data. While a standard PC (running Windows, macOS, Linux, or even FreeBSD) is a good choice for a Plex server, it isn’t the only option. A Raspberry Pi can run the Plex server,, but has limitations for transcoding media data. Or you may prefer a NAS solution, such as the Synology DiskStation 418play Synology DiskStation 418play: The Best 4-Bay NAS For Everyone, with Full Plex Support Synology DiskStation 418play: The Best 4-Bay NAS For Everyone, with Full Plex Support The Synology DS418play is a fantastic choice for a beginner NAS – and even better, it's also the perfect media server, streaming your movies to anywhere in your home. Read More , which features four disk bays and 4K transcoding support for Plex. Once your server solution is sorted out, a client app is needed. There’s a native client for nearly every device (including game consoles and mobile devices)–or you can use a convenient web interface, allowing you to watch your Plex library and stream live TV anywhere on your network. When you’re setting up new hardware for the first time, the last thing you want is for things to go wrong. Unfortunately, this is exactly what happened when I tried to get the HD HomeRun Connect Duo running with Plex. Fortunately, the Plex tech support were equal to the task. After sending the support team some vital information about my setup and event logs, a new version of Plex server was forwarded for me to install. Once it was all sorted out, Plex was successfully streaming live TV from the HD HomeRun Connect Duo across the network, to all compatible devices. By now you should have a good idea of what a good pairing a Plex Pass subscription and the HD HomeRun Connect Duo are. But what can you do with them? Watch live TV: it’s obvious, but important. Terrestrial TV through your antenna is decoded in the HomeRun Connect, letting you enjoy any channel you have access to. Record live TV: no one has a VCR these days, and few set-top terrestrial decoders come with their own hard drive for recording TV. Using the HD HomeRun Connect Duo and Plex, you can store your favorite shows on your Plex server. 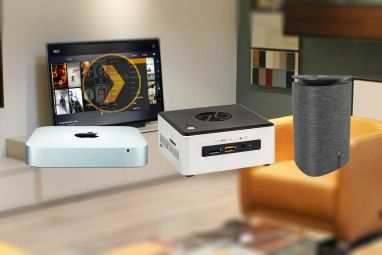 Watch TV in any room: as long as you have a Plex client or the HD HomeRun Connect Duo app, you can watch TV wherever you are on your home network, regardless of whether there is a TV in the room. Mobile Sync for your favorite media to your mobile device, allowing you to watch offline and save data. User control: parental controls and user-specific accounts to restrict access. Advanced audio features including automatic crossfades. Automatic camera upload from your phone or tablet to your Plex Media Server. Premium music library and lyrics. Automatic photo tagging, and timeline view. And of course you have your standard Plex features: streaming your media library of TV shows, movies, music, and photos across your network, and gathering your favorite podcasts. Hey, Cord Cutter: Should You Buy the HD HomeRun Connect Duo? HD HomeRun Connect Duo is compact, easily hidden, streams live HDTV across your home network and features two tuners for watching two channels (or watching one and recording the other) simultaneously. If you’re cutting your cable cord and want a slimline solution to over-the-air HDTV, try Plex with the HD HomeRun Connect Duo–you won’t be disappointed. Explore more about: Cord Cutting, Internet TV, MakeUseOf Giveaway, Plex, Smart TV. Why not to try it? Beware. There’s no guarantee Plex will keep all the features you enjoyed today for any length of time. They have a history of releasing “updates” that reduce functionality with no regard to what their user base actually wants. Take a good look at the complaints overflowing on their support forums before spending any money on Plex. Silicon Dust also has 4 tuner models. What this article did not even take into consideration is, you can do all the main things with many other DVR's and not need to buy other devices to do it. For $99 I got a dual tuner Tablo that does most of the same things and I do not need to buy anything else like a Nvidia ShieldTV or computer to do it. Plex with the way they just out of the blue remove features, I would not rely on that especially for my main source of viewing. It's great to use for a lot of things don't get me wrong, just OTA and DVR there are much simpler and way better solutions out there. This sounds good since I want to be able to record OTA TV shows, but also would like to buffer what I’m watching so I can stop a show while I need to do something else, or be able to go back to see a good play again while watching a sports event. Can this be done with the HDHomeRun/Plex combo or anything else? Emby DVR is superior and the upcoming release of the current beta is going to be the best since WMC.